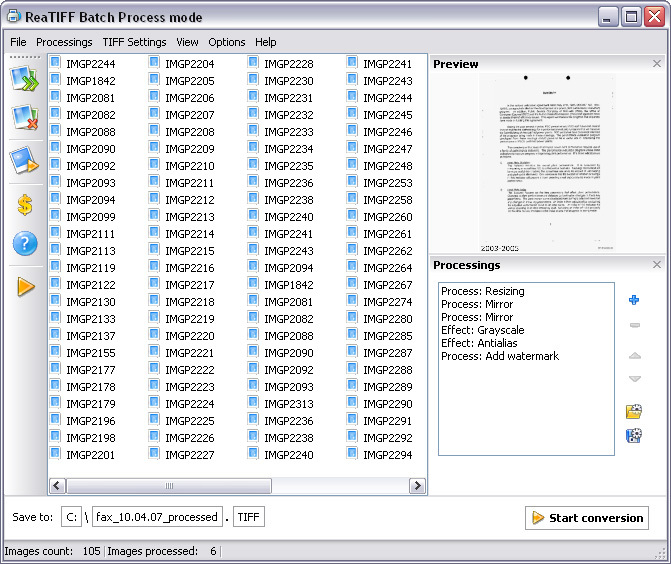 With the ReaTIFF Batch Process mode you can convert a lot images at once. You should use this mode when you have a number of images to convert and you want to apply exactly the same image processings to all these images. Or you just want to do the mass convertion without any processings at all. Open your images with "Add images" button or just drag-and-drop them from Windows Explorer. (optional) Add image processings to the processings list. ReaTIFF includes several image manipulation functions, including resize, crop, rotate, mirror, brightness, contrast, border, watermark and a dozen of various artistic effects. (optional) Adjust TIFF comression method. Convert your images with "Apply and Convert" button. Download and try ReaTIFF for free!